Amongst collaborative project delivery methods that have taken hold in the construction industry, the Joint Venture partnership is perhaps the most famous one. When projects become large and complex, firms team up to form a new legal entity that shares risk and reward. This style of project delivery requires a high-trust model of collaboration across firms, multiple disciplines, and multiple locations around the world. This enables smaller firms to combine their efforts and amplify their capabilities, allowing them to bid more competitively on a project than if they bid alone. When should you use a joint venture agreement? A joint-venture agreement should be used when your firm wants to bid on a project but does not have the bandwidth or expertise to execute all components of the project well. This could mean a lack of critical resources, specialities, local or critical knowledge, or quickly scalable manpower. Joint-venture partnerships place the responsibility equally on both parties involved. Shared responsibility means shared accountability, so both teams have an equal investment in the project. What does a successful joint venture project look like? 1. 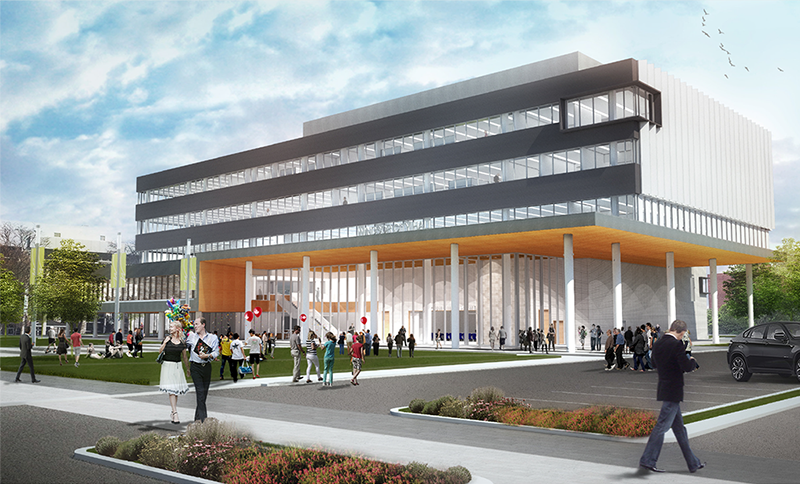 Moriyama and Teshima Architects designed Windsor City Hall in a joint-venture with Architecttura. The project was awarded as a joint venture between Moriyama and Teshima, a Toronto-based collaborative studio and Architecttura, a local firm in Windsor. The firms had two major requirements: to be able to communicate seamlessly and view files at any time from any device, AND to share complex BIM models in one platform. BIM collaboration software BIM 360 Team and Collaboration for Revit helped them do just that. 2. Martinez + Johnson and Netherlands-based Mecanoo Architecten are design partners in a joint venture on the modernization of the Martin Luther King Jr. Memorial Library in Washington D.C., a 400,000 sq. foot library designed by famed German architect Mies van der Rohe. No matter where the two firms’ designers are, they were all able to access the same model at the same time. The communicator feature in Collaboration for Revit allowed real-time chat functionality. Users could attach Revit screen shots or send important messages to others in the model. Not having to leave the Revit environment meant less distraction, more focus, and greater efficiencies gained on the project. 3. Newman Architects found that using a VPN to share large Revit files caused acute latency issues. They investigated upgrading to network appliances, but found that setting up or expanding the service proved costly. Joint venture projects like these need all-time access to central files from anywhere. Using a VPN to create this unfettered access meant additional IT costs for hardware, bandwidth, graphics cards, and security, which was unfairly taken on by the host company. Collaboration for Revit provided Newman Architects with a scalable solution that responded to the project’s needs. Users could be quickly added or subtracted whenever required with no additional IT support needed, and the firm only paid for subscriptions for as long as was needed. 4. Atkins, Skanska, and Balfour Beatty joined forces in a venture to improve the famous M25 motorway in London. Atkins is the U.K.’s largest engineering and design consultancy. Skanska is one of the largest project development and construction groups in the world, with construction, commercial-residential, and public-private partnerships expertise. Balfour Beatty is a leading infrastructure lifecycle business. Together, they coordinated in integrated, accurate workflows. Atkins began multidisciplinary design with Navisworks® Manage (developed with third party and Autodesk® software). The Skanska Balfour Beatty Joint Venture team then used AutoCAD® and Civil 3D® software to adapt the Navisworks model for construction workflows. Everyone had access to the final construction model through Navisworks® Freedom, helping them meet the project’s fast track schedule while still operating the highway stretch. For more information on how technology can enable seamless project collaboration in complex joint venture projects, download our Kickstart Guide to get started with BIM 360 Team and Collaboration for Revit or join us in the forums.